TICKETS WILL BE AVAILABLE FOR PURCHASE AT THE REGISTRATION TABLE. 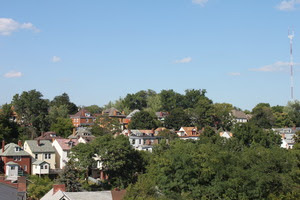 On the eastern rim of Riverview Park winding alongside Perrysville Avenue, the terrain rises north toward Ivory Avenue. In fact, the highest point in Pittsburgh stands at the Brashear Reservoir above the intersection of Vinceton Street and Franklin Road. The tour features trolley rides from Riverview Avenue to that ‘high point’ area of Perryview and on to homes on Waldorf and Orleans. Molly’s Trolleys will again be providing transportation to convenient stops along the tour route. The trolley travels to Perrysville Avenue near the intersections with Richey and Riverview Avenues. The tour begins at Riverview United Presbyterian Church on the corner of Perrysville and Riverview Avenues. Tickets are priced at $12 if purchased by May 20th and $15 from May 21 through tour day. To purchase tickets online click the BUY TICKETS button above.. For more information, call 412-736-2489 or email ohihousetour@gmail.com.